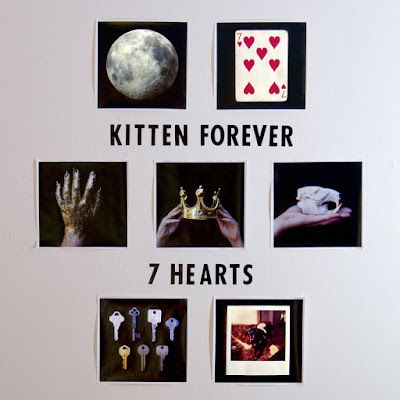 Kitten Forever's 7 Hearts goes down hard, heavy, and fast. 7 Hearts is the latest album by Minneapolis trio Kitten Forever, who we've been missing since we were first obsessed with their 2013 release, Pressure. The LP, which was released on JD Samson and Inge Colsen's young label Atlas Chair Records, feels emotionally real and goes down like a truth-bomb should: hard, heavy, and fast. Their smart lyrics and sneered punk anthems drive home everything from feelings about body shaming to street harassment anger to fighting through fear and ultimately channeling self-worth. You can tell from the first bass twinges and pummeling drums on opener "All Day" that members Corrie Harrigan, Laura Larson and Liz Elton are about to take you on a wild ride with no signs of slowing down for the next fifteen tracks. You can go ahead and think of Kitten Forever's sound as an amped-up version of Bikini Kill's "Double Dare Ya" or "Jigsaw Youth" funneled through a high school homeroom loud speaker. The trio is the first to admit their influences; but their sound goes way beyond any previous genre constructs. Their formation and growl is as unique as the instrumentation and life that fills the deconstruction and raw power of each track. "Who are you! / To tell me who I am! / Who are you! / To tell me what I want!" they chant on the powerful "Brainstorm". With three members and intentionally only two instruments (bass heavy on fuzz and drums) their sound is huge, and with a third member cutting through on distorted vocals using a D.I.Y. telephone mic – the crackling static and energy here is boundless and palpable. Lyrics from "Heavy Dreamy" show a band at ease when it comes to writing from a self-assured positiveness that lays both self-love and intention bare: "I'm a Scorpio rising / And I wanna walk down Lover's Lane / I'm a Scorpio rising / And I wanna be skin to skin and chain to chain / I'm a Beanie Baby sad sack / Wind-up heart attack / I'm a Beanie Baby sad sack / Wind-up heart attack!" Kitten Forever is as real as the anthems they write and that makes their album a true experience that you will want to chant along to. Listen to Kitten Forever on bandcamp. Carly M. plays the drums in Philly's Pretty Greens. She is a feminist and has been writing about and interviewing bands starting as a college radio DJ in the late '80s in Windsor/Detroit. The first zine she ever wrote was dedicated to the band Lungfish (Rainbows from Atoms, Dischord, 1993). She attends at the temple of John Hughes: Samantha Baker and Jake Ryan, together forever - Amen. Find more writing here or playlists here.